What are your thoughts about being a small business owner in Duluth, MN & What is your favorite part about being a small business owner in Duluth? It’s an exciting time to be a small business owner in Duluth because you have endless resources. A lot of my friends, neighbors, coworkers, and family members have small businesses too, so if I need help with something, I have no shortage of people to talk to. Duluth fosters the small ‘craft business’ model. I’m inspired everyday by the talent in this town. What got you involved or interested in being a small business owner in Duluth, MN? I grew up in Duluth, and I’ve always known this is the place I was meant to be. My forever home is only one mile from my childhood home and I’ve never even considered moving away. With that, most of family members are entrepreneurs, so all of it just feels natural to me. What is the main influence behind your products? My products are influenced by our surroundings. They are natural, rustic, and simple yet high quality. Does the Duluth environment influence or inspire your product(s)? Yes and yes! Our wooden wicks crackle like a wood burning fireplace. We choose scents that are warm, comforting, and nature inspired. Also, we use soy wax, which is a Midwestern crop. Duluth is synonymous with all things nature and outdoors. That is the feeling behind my products as well. Any advice for people beginning or thinking about starting a small business not only in Duluth, but anywhere? Oh gosh, I suppose the best advice I can give is to start within your own talents and ask for help whenever you need it. Try not to get wrapped up in the end goal, just start small and work each day to improve a little bit. What is your favorite product or scent that you have made? My preference tends to lean toward a more masculine feel and scents that are woodsy. 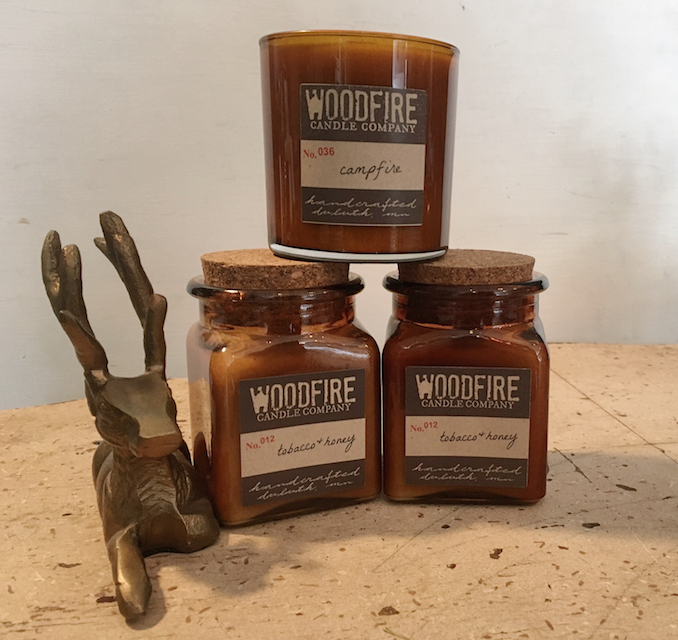 I’d have to say my favorite would be a mountain pine scented amber whiskey glass candle. I could burn that everyday for the rest of my life and not get tired of it. It doesn’t hurt that I can re-use the glass for a gin and tonic either. If you were to create a perfect team of only 4 people to help run your company, what traits would you look for in them? Creative, hard working, fun, and energetic. What is your favorite hidden gem in the Twin Ports area - Why? My favorite hidden gem in Duluth is my little neighborhood of Fond du Lac. We are nestled between the river and the woods. It’s quiet, beautiful, comforting, and inspiring. It’s rich in history, but not pretentious. There are endless activities right outside your door, but it’s not busy. It’s perfect if you ask me.